The Headstarters from Winterport spent more than two hours participating in student run activities in the Garden Project today. 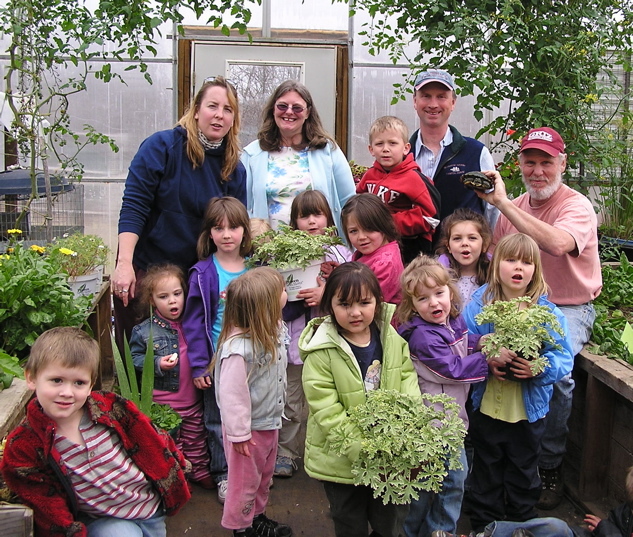 A scavenger hunt was set up by garden team members to intrduce the visitors to the greenhouse and a planting activity. The children planted beans and milkweed (for the monarch butterfles), named our turtle “Franklin”, worked a bit in the garden, fed the rabbits and sorted red wiggler worms for their own Classroom Worm Farm. Lunch was eaten out on the picnic table before taking this picture and picking flowers for their hair. Thanks to all of the garden team students who gave their lunch period to help!